Is your green thumb being put to the test? Tired of your brown lawn and dying house plants? Mystified how others grow big juicy tomatoes while yours look more like red goofballs? Do your plants want to run away from home? Growing healthy plants and having a green lawn may seem like a mystery but really it relies on some very simple elements including: light, moisture and soil levels. And there's an easy way you can test each one. The HealthyWiser 3-in-1 Soil Meter is three meters in one device. With our soil pH meter you can check moisture, light and pH levels in your soil. This easy to use meter is compact and works for both indoor and outdoor plants, veggies, flowers and lawns. Which saves you time, money, and effort because healthy soil produces healthy plants that resist insect damage and disease. For example, without knowing the pH level of your soil you can easily waste money on amendments that you don't need. You may also be over watering or under watering your plants and unknowingly damage the root system of your plants. Without the proper amount of light your plants will also suffer. And our moisture meter comes with a no questions asked 90-day money-back guarantee. 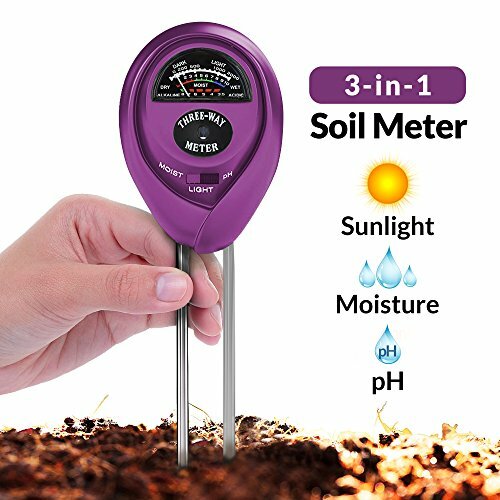 So grow like a pro and click on the Add to Cart button to have your HealthyWiser 3-in-1 Soil Meter shipped today!  GARDENING MADE SIMPLE! - Find out what your garden or lawn needs with a little help from our soil test kit! You can now know whether you need to water your soil, amend its pH levels or adjust its lighting!  TIME-SAVING & COST EFFECTIVE! - Our premium soil tester saves you both precious time and money, by helping you maintain your soil and, consequently, your garden or lawn in tip-top condition!  NO MORE FALSE READINGS! - Our exquisite piece of soil testing equipment is a rare combination of precision, accuracy and durability, which guarantees that you will never have to repeat a reading again!  EXTREMELY PRACTICAL & EASY TO USE! No need for batteries or preparation; you simply plug our soil tester in the soil area you want to check and instantly get an accurate and precise reading!  BUY WITH CONFIDENCE! We firmly believe that our gardening soil test kit is the best product your money can buy. But if you don't love it, we offer you a 90-day money back guarantee! If you have any questions about this product by HealthyWiser, contact us by completing and submitting the form below. If you are looking for a specif part number, please include it with your message.